Is Dhaka city prepared to face the twenty-first century? 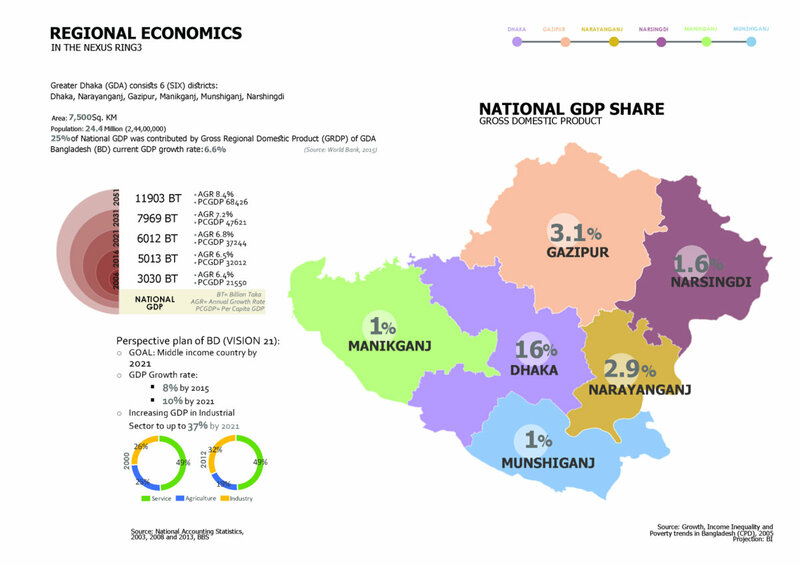 Positioned to be one of the most economically dynamic cities in Asia, Dhaka is predicted to be ranked at 48 by the year 2025 with an estimated GDP of USD 215 bn, way above Rome, Karachi, Hanoi and Montreal (UK Economic Outlook, 2009). Dhaka is poised for a new era but are we ready? Dhaka is “growing” in its own happy rhythm, spurred on every now and then by fragmentary planning initiatives. This “growth” is neither relieving pressures at the centers nor creating a decent urban development anywhere. The initiatives do not contain any broad perspective regarding the overall spatial matrix of Dhaka and future changes. We propose a “Dhaka Nexus” in which the city and its greater neighborhoods – the region – are brought under an active and coordinated planning net. In the nexus, selected existing nodes across the region may be revitalized by relocating and distributing commerce, institutions, and government offices in a uniform way. 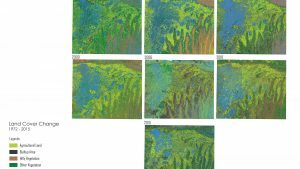 New concentration of urban nodes may also be considered. All nodes and hubs, old and new, may be connected by a coordinated transportation network. The nexus system can support the creation of multiple and diverse kinds of settlements, catering to different needs and experiences. Better quality of urban life in the nodes, with less travel time, will encourage decongestion in existing Dhaka. 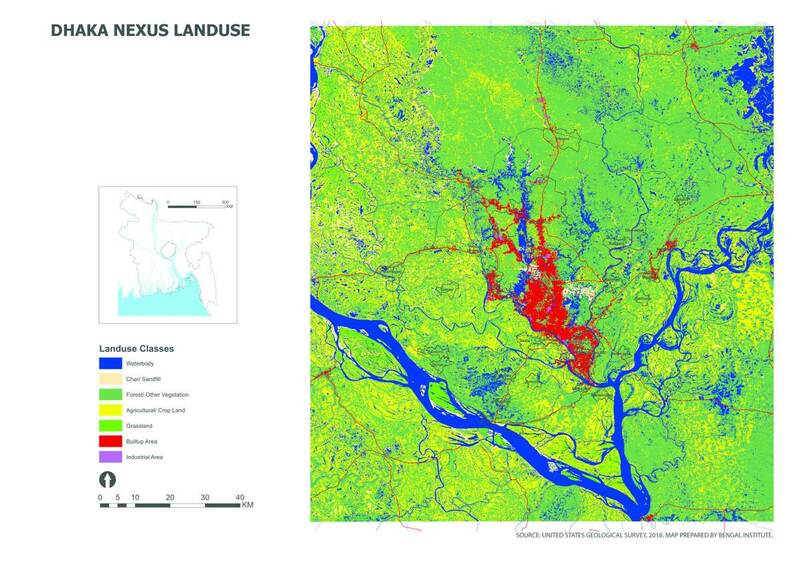 Once the footprint of the expanded Dhaka is identified, nodes in the nexus and in-between areas should be carefully delineated so as not to affect more agricultural areas and wetlands. 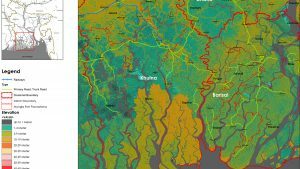 A rigorous balance should be established between Dhaka’s urbanization needs and ecological obligations. 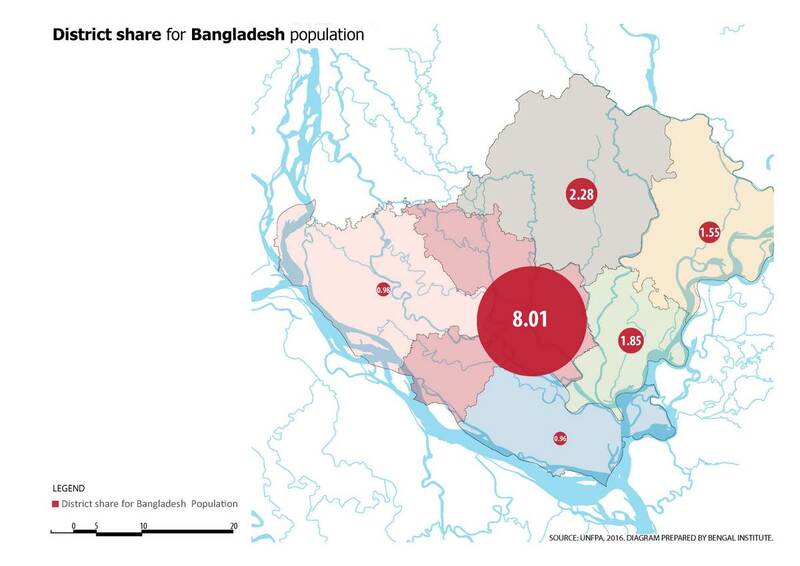 Dhaka needs to spread out and yet remain connected for which transportation is critical. An organized, dispersed “city region” will have to rely on an efficient public transportation system that could be a combination of fast commuter train, light rail transit, extensive bus network, and riverway ferries and vehicles. Lessening travel time will be key for the performance of the nexus. In a fast north-south train corridor linking Dhaka and Mymensingh through a new north station, travel time can be reduced to two hours. It will be possible that one could finish a day’s work in Dhaka city, return to Mymensingh to an air and light filled residence, and enjoy a promenade along the Brahmaputra river in the evening. 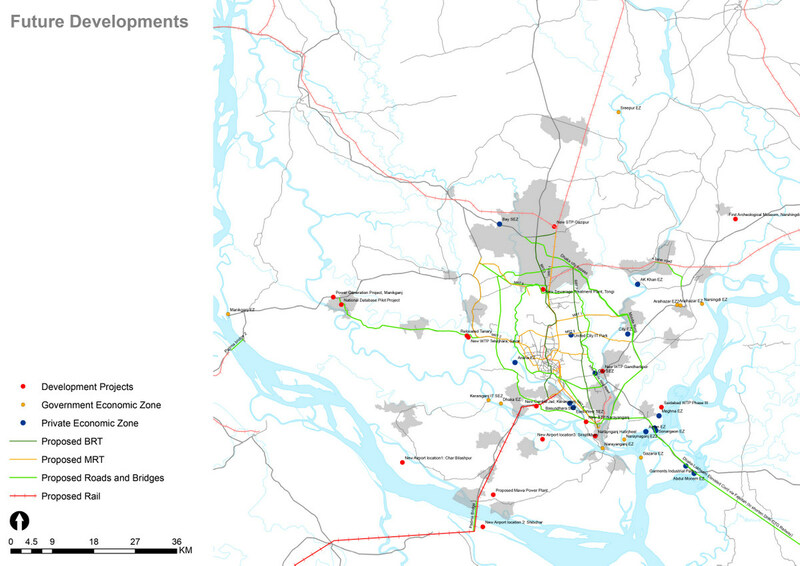 We propose three transportation rings around Dhaka that will be the organizational basis of the nexus. The first ring – NXS1 – is located along the existing embankment roads of the city and connects Tongi, Savar, Keranigonj and Tongi. The ring is made up by an expressway, circular fast train line, and circular waterway. The circular road, river and rail system will connect the two stations around the city as well connect smaller stations along the lines. Radial roads and trainlines from key nodal towns will connect towns and hubs in various rings. The second ring – NXS2 – connects Naryanganj, Bhulta, Pubail, Gazipur, and Hemayetpur. Linking with NXS2, we propose creating two new major train hubs: one at Gazipur-Joydebpur as the North Station, and another at Keranigonj as the South Station. From the North Station, passengers can take faster trains to travel to northern and eastern districts. From the South Station, proposed as a new development hub, passengers can travel south, south-west and south-east. NXS3, the third ring, connects Munshiganj, Mawa, Narshingdi, Kapasia, Kaliakoir, Manikganj, and other towns and settlements. 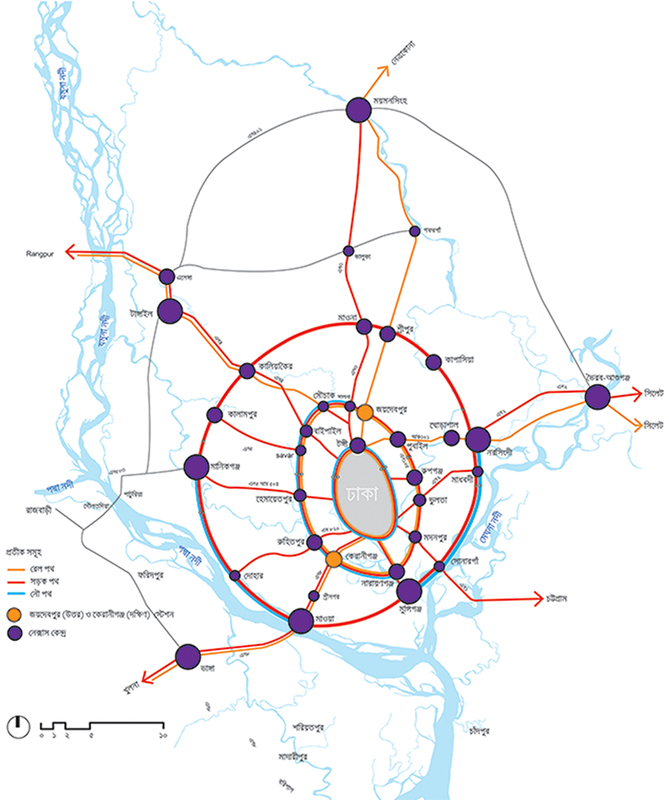 Radial roads and trainlines from key nodal towns will connect areas in various regions beyond Dhaka. The creation of this organized nodal network is also based on a clear demarcation of the boundary of each node as well as that of areas that lie between nodes. In-between areas mean smaller settlements, villages, agricultural lands, forest areas, wetlands, flood-plains, etc. While each node may be planned and defined by distinctive types of residences, commerce, industry, administration, education or other functions, the in-between areas should also be carefully planned for their particular use and potential.